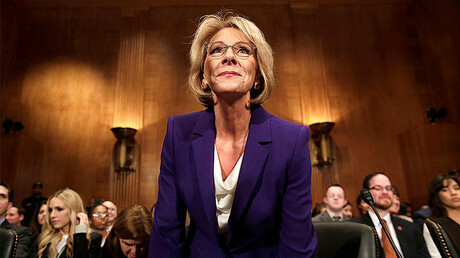 The US Senate has confirmed Betsy DeVos as education secretary, despite efforts by Democratic senators who held the floor for 24 hours in a filibuster. Vice President Mike Pence cast the tie-breaking vote. All 48 members of the Democratic caucus and two Republicans ‒ Senators Lisa Murkowski (Alaska) and Susan Collins (Maine) ‒ voted against DeVos' confirmation, leading to a 50/50 split. It comes after Senate Democrats held the floor for 24 hours, hoping that at least one Republican would vote against party lines and against DeVos' confirmation. Speaking ahead of the filibuster on Monday, Sen. Patty Murray (D-Washington) said the move was aimed at doing "everything we can to persuade just one more Republican to join us." The vote comes after a rare early-morning session on Friday, in which senators voted along party lines, 52 to 48, to end debate on DeVos's nomination. 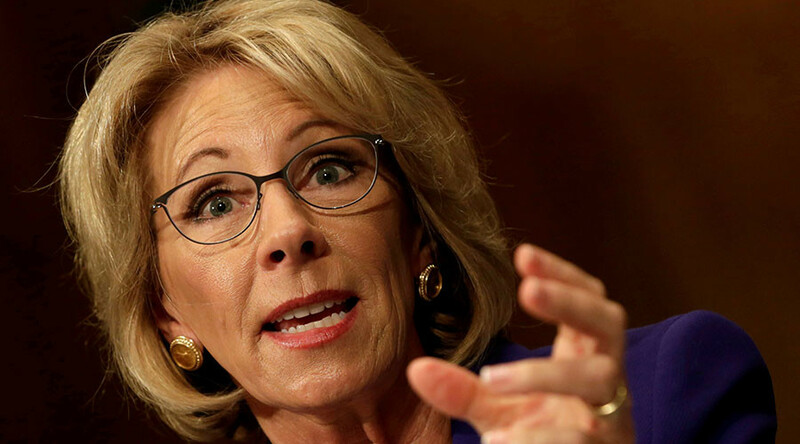 DeVos, a Republican Party chairwoman from Michigan, has faced a number of hurdles in being approved for the post, prompting a wave of opposition which is unprecedented for the position of education secretary. Much of the controversy surrounding DeVos stems from her support of charter schools, leading critics to accuse her of being against public schools. She has been a vocal supporter of such schools, as well as school choice. Conflicts of interest have also plagued DeVos since her nomination, with Democrats noting that her former political action committee had unpaid election fines. They also pointed to campaign contributions to the same GOP senators who have been tasked with considering her for the position of education secretary. Even more issues were raised during her confirmation hearing. The first occurred when she appeared not to know the difference between “proficiency” and “growth” when it comes to students' test scores and measuring success. “It surprises me you don’t know this issue," Sen. Al Franken (D-Minn.) said in response to her apparent lack of knowledge. Disability rights groups and advocates have also taken issue with DeVos. Their discontent arose after she was asked if schools which receive federal funding should abide by the requirements of the Individuals with Disabilities Education Act (IDEA), a federal law that requires public schools to provide "free and appropriate" education to students with disabilities. Her response, much to the disapproval of many, was that the issue was "best left to the states." When asked by Sen. Maggie Hassan (D-New Hampshire) whether DeVos knew that IDEA was a federal law, she responded by saying, "I may have confused it." DeVos has also been widely criticized for a response she gave when asked if she'd uphold the 2011 guidance on Title IX, which states that colleges and universities must play a role in combating sexual assaults on campus. DeVos said it would be "premature" to answer whether she would uphold the guidance. In addition to Senators expressing their own concerns over DeVos, Congress was flooded with phone calls from citizens who opposed her appointment. Matt House, a spokesman for Senate Minority Leader Chuck Schumer, said Friday that as many as 1.5 million calls per day poured in last week, according to data from Schumer's technical staff, as cited by CNN. Sen. Brian Schatz (D-Hawaii) tweeted last week that the previous three days had been the "busiest in Capitol switchboard history," and encouraged citizens to "keep it up." Meanwhile, Republicans have praised Trump's selection, including Sen. Shelley Moore Capito (R-W.V. ), whose support for DeVos remains unchanged despite hundreds of people turning up for a protest outside her office on Saturday. When asked about whether Trump “would not forget” the two Republicans who voted against DeVos, White House press secretary Sean Spicer instead blamed Senate Democrats for obstructionism. “The president has been very clear. It’s not Republicans that have stood in the way of this nomination, of all of these qualified individuals,” Spicer said.